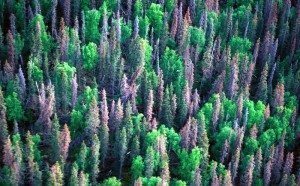 As large swaths of western forests in North America succumb to pine beetle infestation, due in part to warming winters, preliminary studies show that the dead, decaying trees are not releasing the huge flux of CO2 previously feared by scientists. According to a study just released in the journal Ecology Letters, despite the billions of trees killed in the pine beetle infestation ranging from Mexico to Alaska, the expected spike in forest carbon release into the atmosphere has not occurred – at least in the Colorado forest where the initial study took place. “A couple of the early ideas were that, one, it was just going to have this big release of carbon because all of the dead stuff would just decay really quickly, and the other idea was that it would all burn. Neither of these seems to have happened yet,” said ecologist David Moore of the University of Arizona’s College of Agriculture and Life Sciences and lead author on the study. “The general expectation we had was that when trees die on a large scale, it would lead to a big pulse of carbon into the atmosphere through microorganisms metabolizing all that dead wood. The conventional wisdom is that after a massive die-off of trees the surrounding forest would go from carbon sink to carbon source, and the bigger and more sudden the die-off, the bigger and faster the release of carbon. But that may not be the case: “In the first few years after beetles have come in and killed trees, the carbon release from the surrounding soils actually goes down,” says Nicole Trahan, a co-author of the study. Moore and Trahan hypothesize a couple of primary reasons why this is so. Firstly, as trees die from pine beetles there is a decrease in the number of other carbon-releasing microbes that depend on living trees. “We’re fairly certain that the microbial biomass is going down,” Moore says. Secondly, the trees aren’t decomposing on as fast a time scale as expected, thus slowing the release of CO2 from decomposition. The study led by Moore and Trahan focused on two forest locations in Colorado, on the eastern side of the Continental Divide near Boulder and on the western side near Silverthorne. Moore cautions that generalizing the results from these locations to other forests vulnerable to pine beetle infestation, particularly in Alaska and the Pacific Northwest with wetter conditions than in Colorado, remains an open question. Moore and his team will continue their study in Colorado this May, but hope to widen the focus of their research to other western forests.